Safe, drinkable tap water was once a given, but many people now doubt its safety and dislike its taste. Many people have resorted to bottled water, which is expensive, inconvenient and environmentally unfriendly. Now there’s a better solution. You can once again have safe, delicious drinking water straight from the tap. 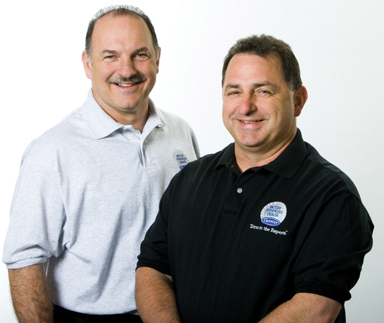 Joseph Frederick & Sons’ water filtration team can test, diagnose, and treat your water so that you can be confident in its safety and happy with its quality. Joseph Frederick & Sons can provide you with an inexpensive reverse-osmosis (RO) filter – or a whole-house system that will remove particles, cloudiness, rust, colors, and odors from your water. The RO filter mounts under your sink, or in the basement below your sink, providing you with unlimited fresh, purified water every day, without polluting the environment with plastic bottles. • Drinking tap water costs about $0.23 per day for a family of four, compared to about $1.25 per day for bottled water. • Bottled water produces up to 1.5 million tons of plastic waste per year. • That plastic requires up to 47 million gallons of oil per year to produce. • More than 80 percent of plastic bottles are simply thrown away, not recycled. 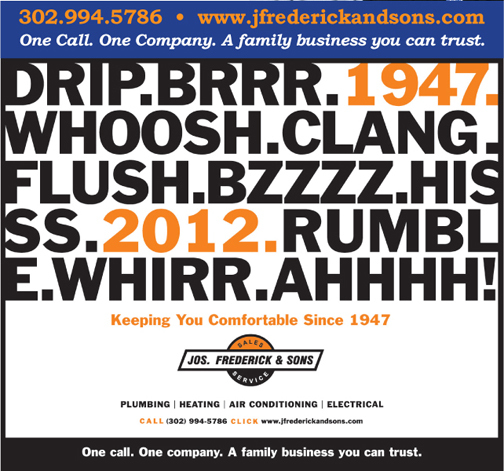 This year, we at Joseph Frederick & Sons are excited to celebrate our 65th year in business. Our grandfather started this business in 1947 with one truck, a willingness to work hard, and a sense of integrity. Today, four generations later, we are proud to say that the name Joseph Frederick & Sons means the best in residential and commercial air conditioning, electrical systems, heating, and plumbing. The core values on which our family’s business was first built remain its cornerstone – our sense of integrity, dependability, and quality workmanship has withstood the test of time. We are a proud member of the BBB and past winners of their Torch and Rush awards. 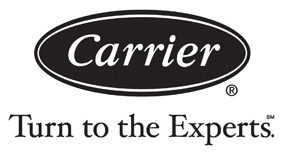 We are also a Carrier Factory Authorized Dealer and 3-time winner of their prestigious President’s Award. Great kitchens and bathrooms are more than just pretty cabinets and nice color combinations. To create a truly great kitchen or bathroom, the plumbing, air flow, and electrical planning must be part of the initial design process, rather than being shoehorned in at the end. That’s why Joseph Frederick & Sons is the company to call when it’s time to remodel your kitchen or bathroom. With more than 65 years of expertise in heating, cooling, plumbing, and electrical services, we work with you every step of the way, from design through installation, so your new kitchen or bathroom will be well-made both inside and out. We work with top-quality suppliers to ensure that you get the very best cabinets, fixtures, and flooring. To set up a free consultation, contact us today. at Joseph Frederick & Sons. We can personally vouch that they are knowledgeable, efficient, clean and very professional. You run a first class operation! It is not easy to face replacing all major systems in your home. In fact, it’s very stressful. Thank you, for helping us through it.